Magnia Urbica was the wife of the emperor Carus. Obverse: MAGNIA VRBICA AVG, Diademed and draped bust right, set on crescent. Reverse: VENVS GENETRIX, Venus standing facing, head left, holding apple and scepter; D/-. Obverse: MAGN VRBICA AVG, Diademed and draped bust right, set on crescent. 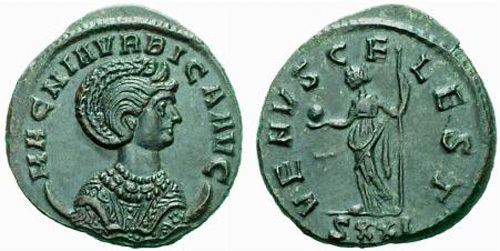 Reverse: IVNO REGINA, Juno standing left, holding patera and sceptre; sometimes at foot peacock. Mintmark: KAG. Reverse: VENVS VICTRIX, Venus standing left, holding helmet and scepter; shield at side. Mintmark: KA(pellet-in-crescent)S.
Obverse: MAGNIA VRBICA AVG, Draped bust right, wearing stephane, set on crescent. Reverse: VENVS CELEST, Venus Celestis standing facing, head left, holding apple and scepter; SXXI. Obverse: MAGNIA VRBICA AVG, Bust right on crescent wearing stephane and richly embroidered robe. 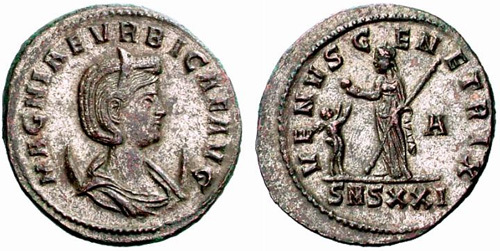 Reverse: VENVS VICTRIX, Venus standing left, holding helmet and slanted scepter, shield below her left elbow. Mintmark: SXXIT. Obverse: MAGNIAE VRBICAE AVG, Draped bust right, wearing stephane and set on crescent. Reverse: SALVS PVBLICA, Salus seated left on chair, feeding serpent rising right from altar to left with patera; -/A//SMSXXI. Obverse: MAGNIAE VRBICAE AVG, Draped and diademed bust right on crescent. Reverse: VENVS GENETRIX, Venus standing left, holding apple and sceptre; in field left, cupid with hands outstretched towards her. In field right, A and in exergue, SMSXXI.